This Is A “Fill In The Blanks” Financial Crisis. Now It’s Time To Fill In Your Blanks. Banks Have Their Backs Covered. Who’s Got Yours? On [just pick a date], the Federal Reserve, the US Treasury, the US President, and Congress agreed to give [Big Name Bank] 300 [Billions or Trillions, take your pick] Dollars in tax payer money, so [Big Name Bank] could buy [Bank About to Fail] for 1 Billion. For those who didn’t know, [Bank About to Fail], one of Wall Streets largest and best known investment bank was bankrupt. [Bank About to Fail] owed more debt than it had in value. Sounds familiar. Kinda' sounds like many people in Foreclosure. Actually, it also sounds like many homeowners not in foreclosure, who have a mortgage loan greater than the value of their home. Just like many ordinary people who have more debt than cash. But I digress. [Bank About to Fail] was in financial trouble because they were worth nothing on paper. So we heard in the news “[Bank About to Fail] must be saved.” Why? “Because if [Bank About to Fail] went under than the whole financial system could have fallen apart. “COULD HAVE”. The stock market “would have” plunged. Big investors “would have” lost lot’s of money. There “would have” been a world crises. First: [Bank About to Fail] was about to file for bankruptcy because…THEY WERE REALLY BANKRUPT!!. Second: The Federal Reserve, the US Treasury, the US President, and Congress determined that if [Bank About to Fail] does fail we will have a World Wide Financial Crises. 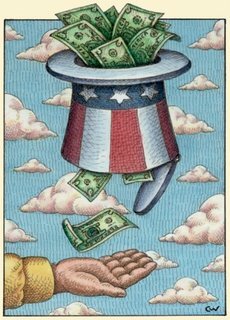 Third: The Federal Reserve, the US Treasury, the US President, and Congress “saves the day” by essentially GIVING [Big Name Bank] [Billions or Trillions, take your pick] of DOLLARS OF TAXPAYER MONEY so [Big Name Bank] could buy [Bank about to Fail] for 1 BILLION. Fourth: The Federal Reserve, the US Treasury, the US President, Congress, [Big Name Bank], [Bank About to Fail] and All the Kings Men shake hands, hug, pat each other on the back, exclaim “JOB WELL DONE” b/c the WORLD DID NOT DESCEND INTO FINANCIAL CHAOS. Do you see what just happened? What does it mean? No# 1 : There are certain people and businesses TOO IMPORTANT to let go Bankrupt even WHEN BANKRUPT. No# 2 : The Federal Reserve, the US Treasury, the US President, and Congress DO NOT NEED YOUR PERMISSION to give taxpayer money away to a BANKRUPT BUSINESS. No# 3 : The Threat of a World Wide Financial Crises is a REALLY GOOD EXCUSE. No# 4 : It doesn’t take a genius to figure out WHO GOT ALL THE MONEY. No# 5 : The employees of [Bank about to Fail], who saw the value of their IRA’s or pensions drop because their [Bank about to Fail’s] stock tanked, WATCHED their MONEY they PAY IN TAXES given to…Well let’s say it WAS not given to them to SAVE THEIR IRA’s or PENSIONS. Truth be told, it is entirely possible that had [Bank about to Fail] actually failed, there would have been a financial crises. It is equally true that if [Bank about to Fail] actually failed, there would NOT have been a financial crises. As is everything in life that could have been, WE WILL NEVER KNOW. So the rules are made and when things get BAD there is only one Sheriff in town and that Sheriff has friends to protect. This is history repeating itself over and over. DO FOR YOUR FRIENDS AS YOU WOULD DO FOR YOURSELF. There are those who claim that the bail out of [Bank about to Fail] created a “moral hazard” because [EVERY SINGLE BANK] will take even more risks and ask for even more bailouts because the Federal Reserve, the US Treasury, the US President, and Congress will cover their behind. And cover their behind they have. For the first time in history, the Federal Reserve allowed Wall Street Investment banks to borrow money from the Fed at a discount (window). 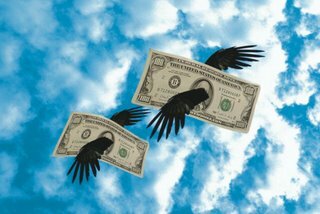 For the first time in history, investment banks can become commercial banks. For the first time in history, the Federal Reserve, the US Treasury, the US President, and Congress can hand out TRILLIONS OF DOLLARS of YOUR MONEY without telling YOU where it is going. It doesn’t end there, the Federal Reserve, the US Treasury, the US President, and Congress gave [Big Name Banks] Treasury Bills (your money) in exchange for [Big Name Banks] worthless collateralized paper. YOUR MONEY FOR BAD PAPER. The paper that consists of collateral debt obligations, sub-prime mortgage backed securities, alt-a mortgage backed securities, credit card backed securities, auto loan backed securities…and the BAD PAPER list goes on and on and on….. It all boils down to one thing. When it all hits the fan, the BIG NAME BANKS’ Peoples get together, handle their business and do what is necessary to keep their stuff together. The question for you is “Will Your Peoples Come together, When it starts to get BAD”. It’s time to fill in your blanks. Some might argue that the correlations between love and happiness are illusory. Ask a poor loved person what they could use more of and chances are they will say money. Ask a rich single person what they lack and chances are they will say love. How do we rank our human necessities and our mental necessities? In doing this, one would also be taking into consideration that our own struggles have fixated our minds on the needs of life, as we see them. If survival is our basic human instinct, does that make love our basic human necessity? I can't say for sure money can't buy me happiness, but I'm positive love has never written a check for my bills. I was a teen mother and the only true description I can give you on our lives at that time is that we were broke, I mean broke to the brokest of broken! Yes, I said brokest. That’s how broke we were. I had to expand my vocabulary in order to describe it because Webster couldn’t even help me with that. I was eight months pregnant sleeping on the floor, and every morning when I woke up although my body felt like I got hit by a 40,000 lb truck moving at 75 mph. I was young and in love. There were times when comfort was by no means within a three hundred mile radius of my life, but I can’t recall ever being really and truly unhappy. My impecunious status not just throughout the times of my pregnancy with my first born, but through life in general was the fuel my mind needed to climb out of the struggle. By the time I was 21, I was a licensed real estate agent. Three children and a career later, I thought for certain my life was coming together. I mingled amongst the rich, and it was smashing! I sipped wine that made my lips cringe and ate cheese that made my nose curl. My swallows were shallow and my breaths were deep when I found out that caviar was processed salted roe, and not just a “seasoning”. I had to talk my body into keeping it down. The thought of puking all over the marble floor was mortifying. I explored my vocabulary to the very depths of my being to validate the house on the corners price tag and its empty lot next door. My first commission check was like winning the lottery, only better. I had done this, I was making money! Things were definitely at their high point because with money came happiness. Right? Wasn’t happiness moneys right hand man? “Money makes the world go ‘round” was what I had heard so many times. Real estate meant money, and in my life lacked money so it didn't take a college education for my mind to convolute the two. Three years into my real estate career, I was divorcing. I by no means blame myself because I know there were so many other issues that came between us, but it's one of those things that isn't supposed to happen when you have life figured out. Through hours of soul searching and chicken souping my hit-by-a-train soul I came to the realization that I had lost all the passion I once knew. Life became strictly business, the laughs and good times were scarce. What I did had to benefit me in one way or another. If it didn’t make me money, I wouldn’t do it. I knew this wasn’t what my HEART wanted to do, but my WALLET loved it. If I didn't have to spend another day sleeping on the floor or worrying about groceries for the next week, I was ok. Wasn’t I? I wasn't ok, this wasn't ok. I lost my grip. I can honestly say only up until recently have I realized what I want to be when I grow up. I revisited my heart and took into account my feelings and my ambitions for life and not the balance in my checking account. 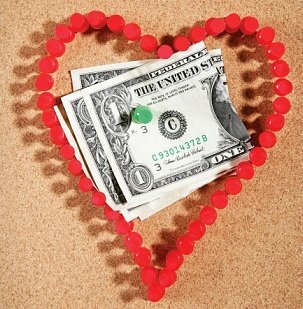 Although you can’t let money drive you, it’s important to remain aware that love alone cannot sustain you. Take all your life’s lessons, unique ideas and yes, even some of those so regretted mistakes and mush them together. Then sift through them patiently until you find that yummy goodness. Find that middle ground in life, and ride life until the wheels fall off! I have yet to meet someone who can honestly tell me they want to struggle for money, but I’ve met all too many who have said the money wasn’t worth the life they lost. I've seen the money, now where is the love? We all know how profitable credit cards are for the banks that issue them. So it's really hard to believe that the credit card unit of America's biggest bank lost close to $1 billion during the third quarter of this year. Citi® made $1.4 billion during the third quarter of 2007. "...Meanwhile, Citigroup is notifying some credit-card customers that their interest rates are being raised by an average of three percentage points. Citigroup is one of the nation's largest issuers of credit cards, with 54 million active accounts. The unit had a loss of $902 million in the third quarter, compared with $1.4 billion in profit a year earlier, as a growing number of customers fell behind or defaulted on their payments. A person familiar with the strategy estimated that the rate increases would apply to less than 20% of Citigroup's card portfolio..."
If Citi has decided to target your credit card account for a rate increase, you will be able to opt out by calling of sending a letter to Citi by the end of January 2009. Citi will let you continue to use your card and keep your current APR until the card expires. American Express is also planning to raise rates by 2 to 3 percentage points for certain Amex credit card cardholders. The New York Times has a similar article about this here. It's getting ugly out there folks. Time to payoff those credit cards. 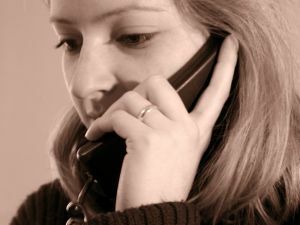 These days, it’s commonplace to swap telemarketer horror stories with friends and family; it’s as American as apple pie. However, wild bill collector stories are also becoming increasingly popular. With the average American carrying an average of $2500 in unsecured debt plus mortgages, many of us know the dread of receiving unpleasant calls from creditors, although we’re less willing to tell the tales. An old friend of mine named Wes is one of the great storytellers - he has spent the last 5 or 6 years climbing out of debt. So, he has collected some war stories along the way. One creditor told him that he wasn’t a real man if he didn’t pay his bills, and another asked him whether or not he truly cared about his family. One debt collector actually called my friend 2-3 times a day, every single day, including Sundays, for months. These relentless predators had no idea what his situation was, nor did they care; they were simply looking for the right button to press to get them what they wanted. However, as bad as these instances were, they weren’t the worst of the worst. There was one case that topped them all. One creditor showed up at Wes’ doorstep. Unannounced, with no attempts to contact him by phone, an employee from a payday loan establishment knocked on the door, looking to collect. Ironically enough, Wes didn’t owe a lot of money, and he had only missed one payment. Apparently that was enough to send someone out on a bounty hunting expedition. As soon as Wes opened the door, the woman began talking a mile a minute about his commitment, how he hadn't been in to pay, and how she had come to pick up the money. The woman didn't even identify herself - she just started talking. Wes had to interrupt her just to find out who she was. Needless to say, my friend was highly offended, and told the collector that she had to leave his property and not come back. I couldn't believe that a guy who was doing everything he could to settle his debts in a timely manner (even when it meant occasionally robbing Peter to pay Paul) would have to be subjected to such treatment, as if he were evading repayment. This kind of harassment should be illegal! Ironically enough, if you won your claim, you’d probably have to turn right back around and hand it over to the guys you just sued. But at the end of the day, your dignity and privacy are worth fighting for, even if you only break even.